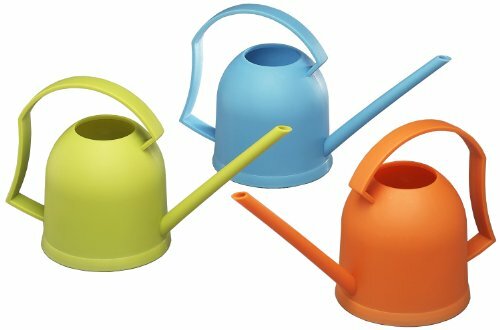 The Arrow Plastics 00070 Garden Essentials Watering Pot is perfect for any garden. The watering pot is perfectly sized for home gardens and holds 28 ounces of water. The handle wraps all the way around the pot so there can be multiple points of contact anywhere on the watering pot to get the perfect pour. The spout has a long neck to reach plants farther away without stepping on any others. The spout opening is also not too large so over watering plants is not an issue either. The Arrow Plastics Watering Pot has an opening on the top for filling. This opening is perfectly sized for a sink or a hose to fill the pot. It is not too big and placed on the top to make sure the pot does not allow water to fall out except out of the spout. Comes in assorted colors selected at time of shipping. The colors are all great and sure to please any gardener. The size of 28 ounces is perfect for holding a good amount of water while not making the pot too heavy to carry around the garden. The Arrow Plastics 00070 Garden Essentials Watering Pot really is a garden essential and great for any home gardener.